Tromping up and around a mountain is bound to build up an appetite, and, well, we'd started the day with oatmeal and a snack of donuts and orange juice. You can guess what that meant. Plainly put, we needed food. Lucky us, our third stop was open, but just by the hair of our chinny-chins-chins. It was already after 3 p.m., and the Red Barn Restaurant in Towaco was set to close at four. Just enough time for us to order and eat an unhurried meal. Essentially, the Red Barn is a luncheonette-type place in a strip mall, taking the 'barn' part of the name to heart. The decor is rustic, with picnic tables taking the place of booths. And the service is exceptionally friendly and welcoming. While the menu has most of the usual diner breakfast and lunch staples, there are also some more creative options among them. I'd venture to guess that they come up with some really nice brunch creations. At that point, though, I really didn't care about the other options. I needed food, and now. Translated: where are the burgers? The burger didn't disappoint. Everything about it was tasty: the bun, the beef, the tomato, the lettuce (green leaf, not iceberg! ), the melty cheese. And, of course, the Taylor ham, cooked just long enough to add a little crispness to the edges. Only thing that might have made it better was sauteed onions, but then I'd ordered rings as my side option instead of crinkle-cut fries. Though they were a little well cooked for my personal taste, the batter was smooth and flavorful and the onion inside yielded nicely to the bite. So as usual, insert good burgers into mouths of ravenously hungry exploring nuts and happiness ensues. After that meal, I was set for whatever the rest of the day would bring us. 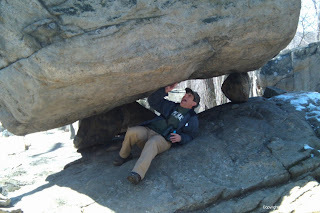 You could say that this week's adventure was our rock tour, as we directed our attention away from the birds to check out some freakishly big stones, right in Morris County. Say "Pyramid Mountain" to folks in the know, and it's inevitable that Tripod Rock will come up. True to its name, this enormous boulder is perched on three much smaller rocks near the top of the mountain. Science tells us that the Wisconsin Glacier brought it to the mountain about 18,000 years ago, and that's just how it was left. It's possible that originally there was sand and other debris under the rock, and it eroded or blew away, leaving only the stones holding it up now. Pyramid was still wearing healthy bits of snow from the inch or few that fell a few days earlier, so we ran into that and a bit of mud along our hike. That, however, was just one thing to consider when choosing where to put your feet on the trail. Getting to Tripod, you get a full appreciation of just how much rock that glacier pulled in its path. After a leisurely walk on a fairly even dirt path, you run into a series of scrambles across and between stones of many sizes. I was beginning to regret having brought the binoculars, as I was having visions of them scraping against the rocks as the incline steepened. About two-thirds of the way up, you're finding footholds wherever you can, and perhaps even using nearby saplings as impromptu walking canes as your feet gain purchase on the next step up. In other words, it's a good workout. All told, you're about 800 feet above sea level by the time you get there, having parked the car at about 600.
that's Ivan off to the side, a few feet behind. is: really big, and mysterious in its own way. It and its cousins are known as glacial erratics, and even though the geologic explanation is totally plausible, it's fun to consider other ways that huge boulder may have been deposited on its tripod. Maybe it was aliens? Maybe the natives were freakishly strong? Maybe a Monty Pythonish god-hand descended from the sky to pluck it up like a pebble and set it down again? Just as interesting, there are two much smaller rocks perched similarly just a few yards away. They're arranged in such a way that on the summer solstice, the setting sun's rays shine directly between them onto another rock directly opposite and several feet away. Depending on who you listen to, this is either a natural occurrence and a spiritual energy vortex, or created by the native Lenape tribe as a way to mark the start of summer. Sure, Tripod offers a nice vista to view the surrounding area, but it's also a great place to get silly pictures, too. I kinda thought that it looked like a big dinosaur head as we approached, as you might be able to see in the first picture. And for those with a bit of hammishness, there's always the chance to show off the results of all those hours at the gym, or even to take on the weight of the world, if you so desire. Once I'd had a chance to catch my breath and get some of the cosmic waves, we hiked further along the Blue trail to a huge rock formation called Lucy's Overlook, named for the woman who led the effort to save the mountain from developers. Save for the right-of-way for a 500kv electric transmission line and the towers that hold it, the landscape looked blissfully undeveloped. It's definitely a good place to sit a spell and contemplate life and the universe without interruption. Moving on from the overlook, we took a rocky scramble to a lower elevation and started running into muddy surface again (I'm going to be so thrilled when I run into a dry track!). A few narrow board walks crossed small streams and rivulets, and soon enough, we found the next mega-stone, Bear Rock. True to its name, it's a bare rock. Standing out on its own in a clearing in the forest, it's hard to miss. A smaller yet still sizeable stone rests behind it, perhaps having split off from Bear at some point in the past 10,000 years or so. The smaller one is climbable, giving you another perspective on just how big this thing is. Farther along the path, there are remnants of a very old house foundation. Whoever built it made ample use of the local rocks, including a large but not enormous boulder. If you look closely enough in several areas of the park, you'll see old stone walls that may have been erected as long ago as the Dutch habitation of New Jersey. Soon enough, we were taking the stepping-stone path across a stream and walking in a clearing along the transmission right of way, gaining and losing elevation in the process. Once back to the parking lot, we found the visitors center was open for visitation. It's a nice little place to get warm and find out about the flora, fauna and geology of the property, including the sandstone and quartz conglomerate or puddingstone unique to the area. "Gneiss rock," Ivan pointed out, gesturing to a sample stone the same color and texture as Tripod Rock. 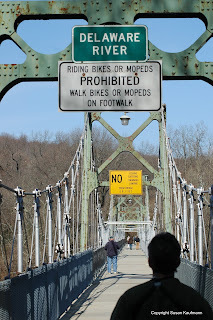 Alas, Sunday was to be the day of narrow bridges and muddy shoes. After a brief lunch stop in Lambertville, we continued up State Route 29 to Bull's Island, part of the Delaware and Raritan Canal State Park in Stockton. 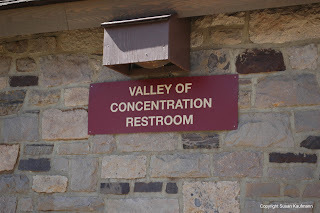 Essentially connecting the two rivers whose names it bears, the D&R Canal was built in the early 1830s to bring Pennsylvania coal to New York, and manufactured goods back in the opposite direction. And while it was quite busy through the mid part of the 1800's, it, like most every other canal in America eventually lost out to the railroads. Now it's one of New Jersey's most used and picturesque state parks, offering level pathways for cycling, hiking, running and horseback riding. Its 70 mile route is also home to several of the original lock and bridge tender houses, and while they're generally not open for visitation, they add a nice touch of authenticity. Our visit, of course, was dedicated primarily to birding, but before we focused on that, Ivan had a nice little treat to share with me: yet another narrow bridge. We'd driven across one to get beyond the feeder canal to the island, but that wasn't remarkable at all when compared to the footbridge over the rushing Delaware. While it was only wide enough to allow maybe three people walking abreast, the bridge was plenty sturdy, with a concrete deck and firm anchors below. It was getting a lot of use while we were there, too: strollers, hikers and cyclists seemed to come out of nowhere to enjoy the trip across. Later, I read that the bridge isn't the first to cross the Delaware at that point. The original was built in 1835 as a covered structure, but part of it was swept away by flood in 1903 and then replaced by a steel span; the whole thing was taken out of use in 1946. 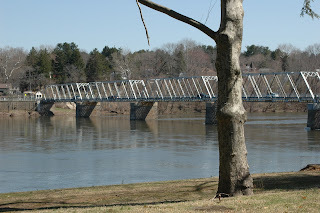 The present footbridge was built in 1949 to allow folks from the Pennsylvania side to get to a now-defunct passenger train on the Jersey side. 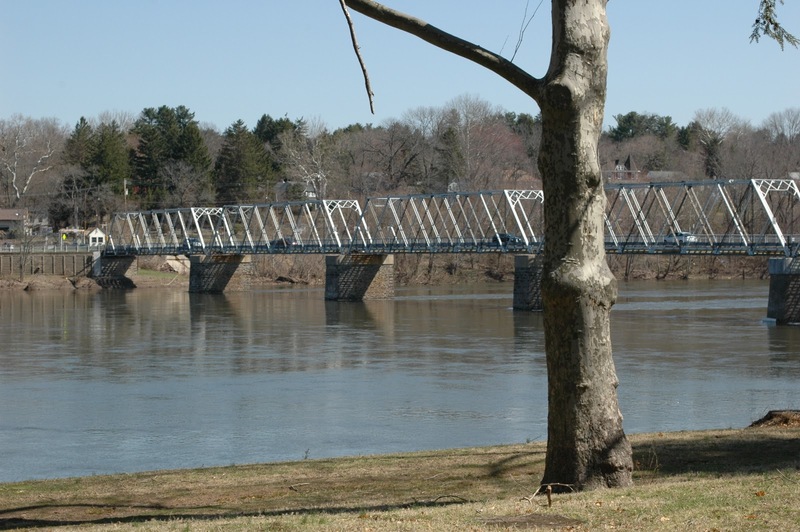 It seems that now, the only purpose for the bridge is to bring people between Bull's Island and the unbearably cute hamlet of Lumberville, Pennsylvania, in scenic Bucks County. Of course, there's an adorable inn along the river, with a general store/gourmet deli right across the street. It seems to be a good place to have one of those weekends that feels about a week long. Once back across the river, we got the birding going. Given all of the recent rains, it wasn't surprising that the towpath along the canal had that special 'give' of mushy ground. I wouldn't say it was muddy; it was more like the consistency of undercooked brownies (mmmmm.... brownies!). Note to self: check boot treads before getting back into the car. We weren't far down the path when Ivan spotted what, to me, was a fairly remarkable sight: a pileated woodpecker. For the uninitiated, it's best described as a big honkin' woodpecker (not that it honks -- you know what I mean). The photo to the right doesn't quite do it justice -- it's a little blurry and you can't really get a sense of size, but take my word for it when I say this is probably twice the size of the average hairy woodpecker drilling away at a tree in your backyard. We were treated to a few minutes of watching this guy checking out a few limbs, plus the spectacle of him flying away to a distant other tree. That just about made my day. It certainly made all of the brownie-tromping worthwhile. Farther along, we navigated through and around a nest of fallen limbs to find some other feathered fauna, including a happy little song sparrow just singing away. Spring is the best, isn't it? So much cheerful noise all around. Eventually, we decided we had enough and made our way back to Route 29 and who knows where. Trusting the Garmin to get us home, we realized there were a few other places we might find along the way. What next? Washington's Crossing: What if the Father of our Country had had E-ZPass? After checking out Riverview Cemetery, we made a quick pit stop at the Trenton Visitors Center in the old Masonic Lodge House located on Barrack Street, not far from the State House and the War Memorial building. The small fieldstone building was erected in 1793 and has since been replaced by a grander structure just up the street, but according to the young woman staffing the visitors center, the Masons still occasionally hold meetings there. Interestingly, the first grandmaster Mason in the New World was a Trenton native, Daniel Coxe. A short history of the Battles of Trenton and Princeton is prominently displayed in the main room, complete with strategic troop movement maps and an outline of events. Known to Revolutionary War buffs as the ten crucial days, this period in the winter of 1776-77 started with Washington's famous crossing of the Delaware River on Christmas night, continued with valiant fighting in Trenton and ended with a decisive victory at Princeton ten days later. These battles were particularly important to the cause, as Washington's troops were dispirited from several previous losses, and weren't re-upping after their 30-day enlistments came to a close. Winning in New Jersey gave the Continental Army a much needed shot in the arm and the encouragement to continue fighting for the cause of freedom. The whole venture started with the transport of 2400 troops, sizeable quantities of artillery and horses across the river from Pennsylvania to a site about 10 miles north of Trenton. Both states maintain parks at the crossing, and while I'd been to the New Jersey side, I hadn't ventured to its Pennsy counterpart. In my mind, it doesn't matter so much where Washington left from, as much as it does where he landed. But, given it's a site so closely related to New Jersey history, I agreed with Ivan that it warranted a visit. 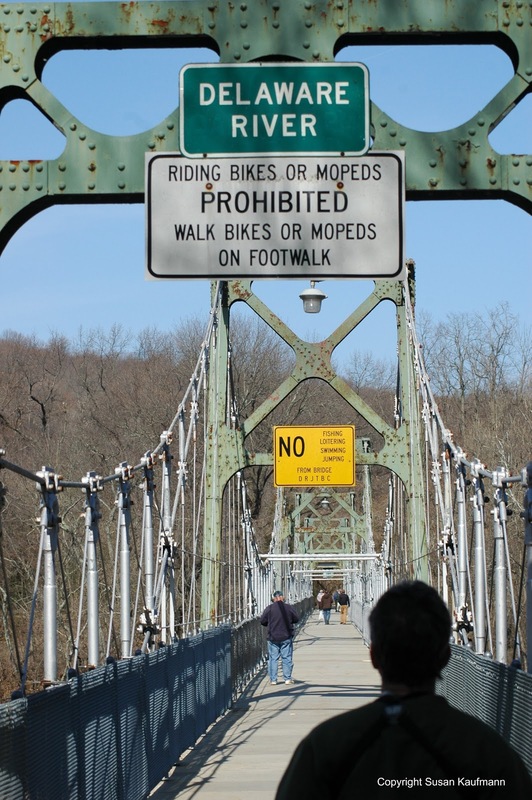 Unlike the larger toll bridges farther downstream, the span across the river to Washington's Crossing, PA is barely wide enough to accommodate two cars passing each other. Not surprising, since it was built sometime in the 1830s. As we crossed the Delaware, I resisted the urge to stick my head out of the sunroof and gaze forward determinedly as Washington did in the famous Leutze painting. It was enough of a challenge to nudge past oncoming cars without losing the side-view mirrors. The bridge deposited us in a tidy little village of colonial vintage, aside from the construction office-type trailers being used as temporary quarters for the visitors' center. Unfortunately, the boat sheds were also closed; Ivan told me that the replica flat-bottom Durham boats were huge and deserved a good look, so that will have to be done on a future visit. I'll leave you to mull on that one, but I'll tell you that my mom always advised making a quick visit before heading out on a trip. Perhaps Washington did, too. We can safely assume he wasn't about to turn the boat around to accommodate someone's bathroom needs. The birding was variable; the presence of bluebird boxes led us to try to find a few, without luck. We did spy a black vulture across a pond, plus some other random songbirds and such. 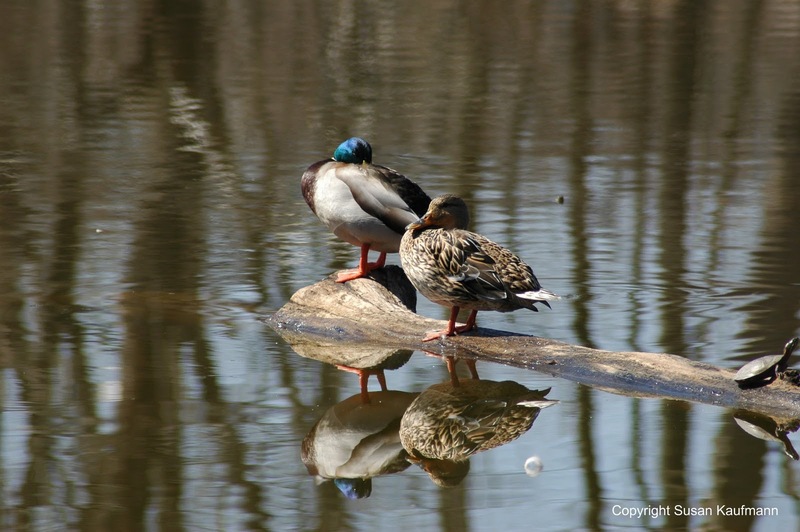 And I was able to get a pretty neat shot of a couple of mallards taking a rest (plus a bonus turtle to the right). If you happen to be in the area at Christmas, it's well worth a visit for the reenactment of the crossing. You can even participate if you register in advance and wear a period costume. Be warned, though: for several years, the troops took the bridge because the river wasn't high enough to support the passage of loaded boats. It makes one even more thankful that the weather was what it was when Washington brilliantly planned to surprise the Hessians at Trenton. Since our trip to Fort Mott, it's been on our short list to get to Riverview Cemetery in Trenton. 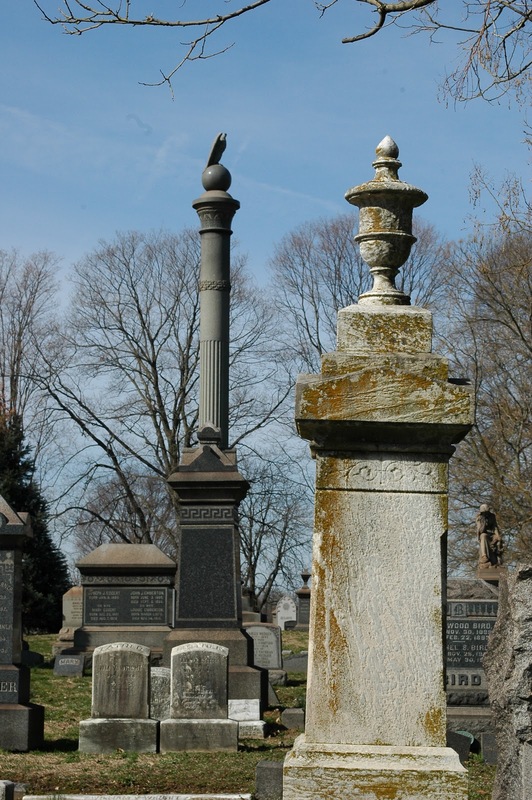 Not only is it an old graveyard, but it's noted as the final resting place of several prominent New Jerseyans of the 19th and early 20th centuries, including governors, senators and Civil War veterans. We didn't have much of an idea what we'd find when we got there ... or how we'd get there, for that matter ... but we assumed it had to be somewhere near the Delaware River. 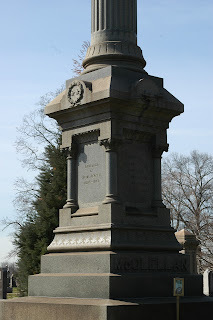 Just part of McClellan's grave marker. His picture is posted at the front. Current day State Route 29 now hugs the river on the Jersey side, so it was a fair assumption the cemetery would be within line of sight, and hopefully the road wouldn't have displaced important graves. After a bit of wangling with the Droid and the GPS, we found the right location and were on our way. Once we got there, we found that the cemetery offices were closed, and there were no instructive maps to guide us, so we were pretty much on our own in finding the stones for any famous people. Our main interest was in finding the grave of Civil War General, New Jersey Governor and unsuccessful Presidential candidate George McClellan. He was buried in Trenton despite dying at Llewellen Park in West Orange (he would have been a neighbor of the Edisons had he lived a few more years). His monument was ridiculously easy to locate. 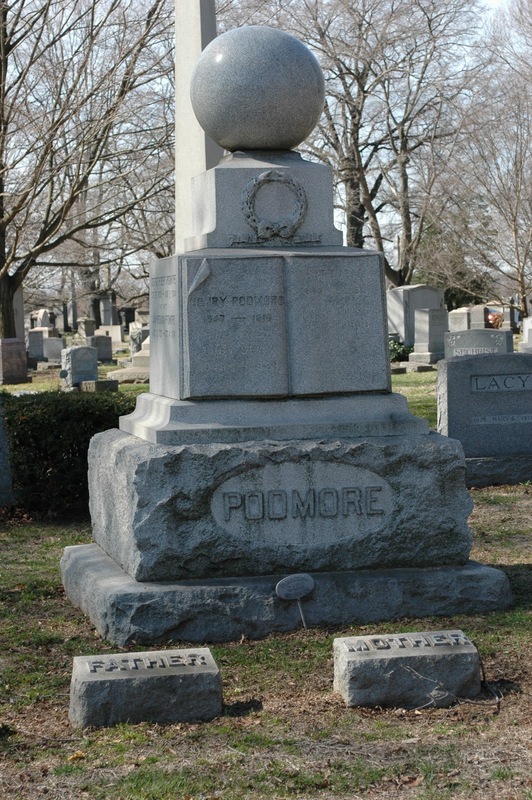 Pretty much maligned by a sizeable faction of Civil War buffs, his grave marker nonetheless stands head and shoulders (many heads and shoulders) above any other memorial in the place. It's a huge stone column with an eagle perched on top, and a base that declares his service to his country and his state. Someone has also thoughtfully placed a framed photo of him in front of the column, and there's a note that the whole shebang was put up by his friends. Apparently he had his allies, after all. 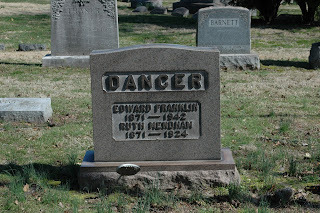 much more modest grave marker. 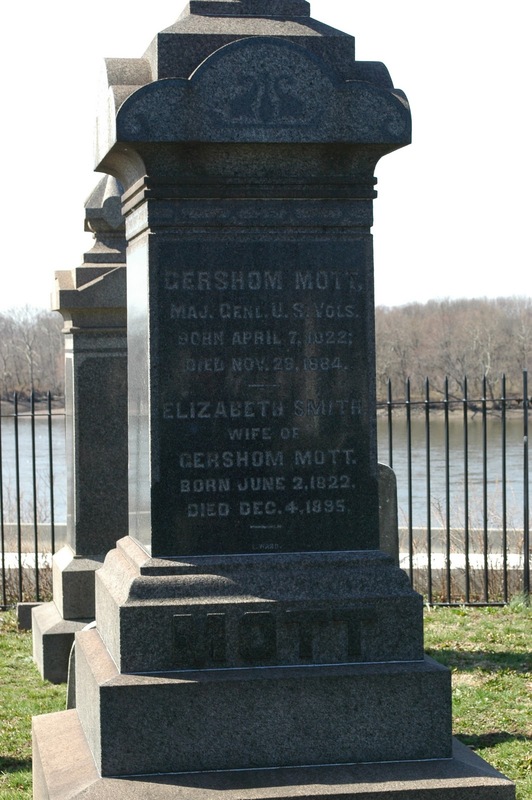 We knew that Fort Mott's own Major General Gershom Mott was buried at Riverview, too, but his stone wasn't anywhere near as ostentatious as McClellan's. 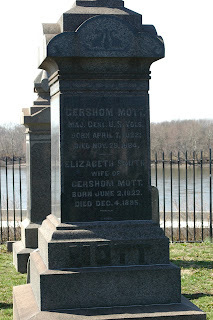 First, we found the stone for another Gershom Mott who must have been his son; the General's own stone was closer to the edge of the cemetery, with a nice view of the Delaware. Along the way, we found several other Civil War veterans, plus some famous names closely associated with Trenton's business community. The Roebling family, noted for their wire rope manufacturing and leadership in the design and construction of the Brooklyn Bridge, was well represented, including patriarch and bridge designer John Roebling, and his grandson Washington who died in the sinking of the Titanic. Sadly, I didn't know that one of my all-time favorite Trentonians, John Taylor, is buried at Riverview, too. Who is John Taylor, you ask? He is hailed by many loyal New Jerseyans as the creator of the state's tasty native breakfast meat, Taylor Pork Roll. (Without him, where would the pork roll, egg and cheese breakfast sandwich be?) It would have been a truly moving experience to pay my respects. 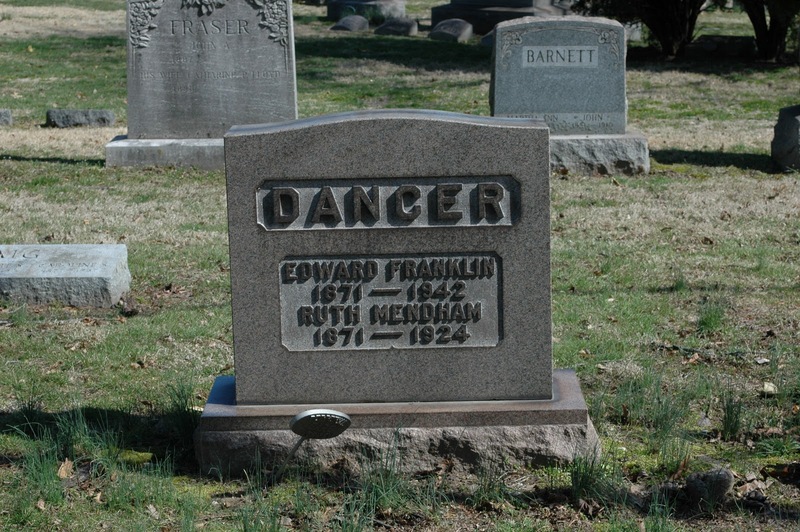 When I first saw this one, I thought the name was "Danger," but apparently that's their middle name, instead. And, well, here's another one. Take a look at this and let me know what you think the family name is. Before we leave Riverview, let's take one more look at the McClellan monument. It's the one on the left, and it's actually a lot bigger than it looks. "We have to go to the Naugle House." It was either that, or words to that extent, that Ivan declared as I steered the car down Route 17. "What's a naugle," you ask? Yup, I asked, too. If you get enough naugle hide, can you make a nice recliner? How many naugles would it take? As we considered various naugle-related questions, we left the highway for some back roads and eventually ended up at Saddle River County Park in Fair Lawn. This, Ivan explained, was a true example of hidden New Jersey: a small gem off the beaten path. "Built by a Naugle?" I exclaimed. Like, what's a Naugle? 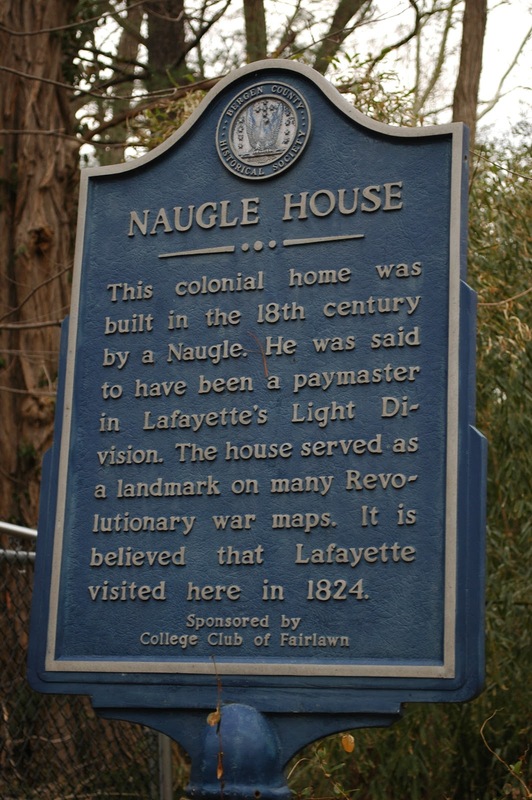 I mean, it's not often that wayside markers are so imprecise as to not identify someone by their full name (unless really famous like Lafayette, that is), so maybe a naugle is a what and not a who? At the very least, this sign seemed to prove that naugle isn't a verb -- there wasn't any naugling going on at this place. Think about it: it was a possibility. I'll leave that for you to consider. Ivan was a bit surprised to see the house in a derelict state, as he could remember it being occupied throughout his school years. In fact, he'd brought college friends there to visit, and they'd met a man there who'd shook the hand of a man who shook the hand of a man who (add a few more generations here) had shook the hand of General George Washington. I guess he had his own little six degrees of Kevin Bacon going on there. (So when you meet Ivan, be sure to shake his hand so you can join in the chain). 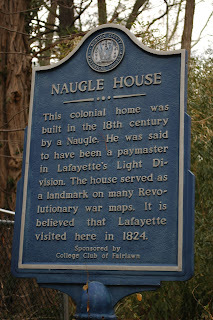 And yes, he confirmed, a family named Naugle had lived in the house. So, me being me, I did a little research once I got home. First off, there are two other Naugle houses (if not more) in Bergen County, both in Closter. These folks apparently got around, but the Fair Lawn house seems to be the only one that someone has claimed was actually built by a Naugle. Imagine that: you've got a handy guy in the family, but he refuses to help you build your house. 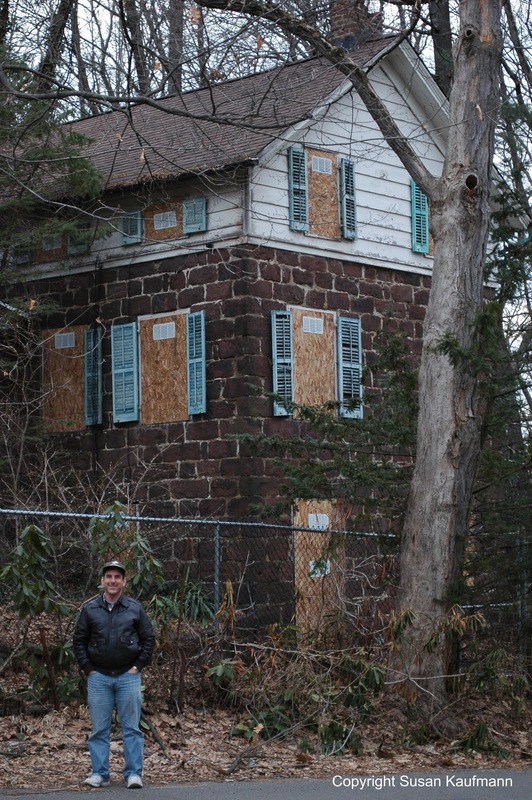 This specific Fair Lawn Naugle house was built sometime in the 1740's or '50's, according to Preservation New Jersey, which placed the building on its Most Endangered list of 2007. The story on the wayside marker is in some doubt, as the property was originally deeded to a Vanderbeck, whose sister married a man named Brouwer who moved into the house and was eventually the paymaster for Lafayette's Light Division. Additionally, it's been determined that Lafayette visited the house in the 1790s, not 1824. No Naugle lived in the house until the 1800s, and then intermittently after that. In other words, the Fair Lawn College Club had the story totally wrong. Regardless, it's a great example of how history can morph and grow into local legends that make a place remarkable even if the story may be specious. And ultimately, the Naugle House is teaching local residents an important lesson about growth, development and the power of small groups of people with a common purpose. In 2004, descendants of the Naugles sold the property to a developer, along with adjacent land, with the vision of building several townhouses. (Yes, more new construction is just what Bergen County needs.) Long story short, local residents passed an open space referendum in 2005 to preserve the house. The whole thing moved forward largely through the action of a persistent group of fourth grade students who prodded the borough to buy the property from the developer. The sale is expected to go through very soon. Now, the house awaits stabilization and eventual restoration, which could take as long as 20 years to complete, considering the need to apply for and receive grants. For the time being, local historians are doing further research to uncover the full story of the house, from its construction to now. Hopefully, they'll be able to get to the bottom of the facts, but even if they don't, it'll be a pretty cool place to visit, incomplete history and all. The random post-flood driving and detours created a felix culpa: a visit to Clifton's own Rutt's Hut, the home of the ripper. What's a ripper, you may ask? Well, let's start with a tasty frankfurter, raw. Toss it (gently, mind you) into a vat of boiling vegetable oil. Allow it to marinate until the skin cracks. Then fish it out and place on a bun. That's a ripper. Those who like to sit while they dine will go to the dark paneled interior dining room, replete with an old man bar that probably still reeks of cheap cigars. Last I was inside, the tables were sticky, and estimating the waitresses' ages would require carbon dating, which would rationalize the slowness of the service. In its own way, though, the dining room is an experience which must be had, if for no other reason than to be entertained by the characters at the bar and the random signs posted on the walls. 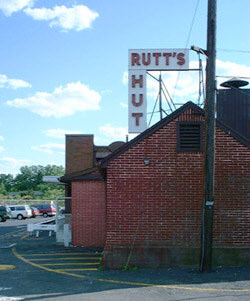 Rumor has long had it that Babe Ruth would stop at Rutt's occasionally, and one could easily imagine him at the bar for a couple of dogs, a couple of snorts and a beer chaser. While still a mass-production outfit, Rutt's will take requests for variation on the rippers -- everything from the 'in and out' (lightly ripped) to the 'cremator' (left in the oil until, well, cremated). They also offer a decent selection of other fast food items, though I really don't know why you'd go there for a tuna salad sandwich. I guess they have to have something to rationalize the visit for people who get dragged there by rabid hot dog aficionados. For our visit, we chose the hot dog, lightly ripped (for me, big shock), the hamburger with gravy (for Ivan) and a plate of onion rings (shared). The dog was just as good as I remembered it to be, and while the o-rings were maybe a little more well done than I usually go for, these irregularly-shaped treats were a tasty diversion from the uniformity of the average fast food version. Ivan mentioned that the gravy was a good addition to the burger, something I'd never have considered using as a topping. Reminds me: the Hut's hot dog relish is well known and treasured in hot dog maven circles. They even sell it in pint and quart sizes for you to take home. Last week's rain storms left a couple of potential exploration sites off limits due to the flooding in Passaic and Morris counties this weekend. It was more than disappointing that we couldn't find a way to get to the Passaic Great Falls in Paterson; given the swollen rivers, the sight rivaled that of Niagara, according to reports on the web. Oh, well... perhaps I can make a solo return later this week. Reversing direction, we hit Route 3 and then 17 and landed once again in Bergen county. This time around, Ivan wanted to show me the Celery Farm in Allendale. True to its name, it was once a commercial agricultural site, and it's been preserved as open space as the surrounding area filled with McMansions and suburbia. The preserve's dedicated lot was already filled with cars, so we found an alternate entrance on a cul-de-sac bordering the property and then took the trail in. Walking along the path, we ran into a fair amount of ground still mushy from the rains, but nothing that prevented us from moving forward. We walked through a wooded area that then came to a marshy area highlighted by phragmites brushing against each other in the breeze. It's probably not a surprise to any regular reader of Hidden New Jersey, but I have been waiting what seems like forever to hear happy bird songs on one of these hikes, and this time I was not disappointed. Unlike the winter walks where we heard nothing but silence, our jaunt this time was occasionally punctuated by tweeting and calls. Ivan pointed out a song sparrow singing his little heart out, reminding us that spring is just a few days away (and, dare I say it, putting his bird-eHarmony profile out there for any potential mates who might be nearby.*). The centerpiece of the Celery Farm is a large pond with several viewing platforms at different points around it. 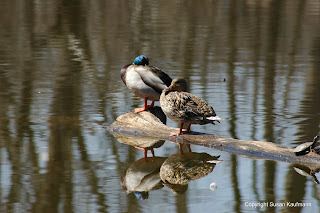 While we were there, we saw a pretty decent array of waterfowl, including wood ducks and mergansers along with the ubiquitous mallards and Canada geese. And we even saw a snake! Not that finding a snake in New Jersey is all that hard (all kidding aside), but in all of my ramblings through the woods, dating back even to childhood, I don't think I ever spotted one on my own. This time, I heard some slight movement in the rotting leaves by the trail, and there it was -- a garter snake gracefully slithering its way along. Just goes to show what you can find when you're attuned. The volunteers who tend to the Celery Farm have done a really nice job of stewarding an environment that's welcoming to both animals and people alike. Tucked in along the path are a few comfortable benches to sit down and contemplate life, and there's also a designated butterfly garden which must be really nice during the growing months. And reflecting the property's previous use, a small, ancient-looking metal tractor sits idle, oxidized and apparently rusted to the ground (check out a nice photo here). Rather than looking as if it was carelessly abandoned there, it adds character to the surroundings; it reminded me that regardless of what we do with land now, nature is always at the ready to reclaim it. * Get it? Bird mating songs? Pairing up? Harmony??? Sorry -- I had to do it. Okay, this one is hidden in plain sight: new things to be seen at Thomas Edison National Historical Park in West Orange. A brief disclaimer here: Edison is one of my personal heroes, and I volunteer time at the labs a few times a month. That’s why I brought Ivan there for a look-see, even though there’s not a birding component to the destination. If you grew up in New Jersey, you probably took a school trip to see Edison’s library, storeroom and machine shop, and then maybe his chemistry lab. Now, all three floors of Edison’s main laboratory building are accessible to visitors for the first time in the park’s history, thanks to a six-year restoration project that was completed in October 2009. Edison called the multi-building complex his invention factory, and it’s the successor to his Menlo Park lab, where he perfected the lightbulb. Opened in 1887, it was the world’s first state-of-the art corporate research and development laboratory, and operated till his death in 1931. The concept was simple: rather than working alone, the boss would come up with an idea and then assemble a team of experimenters to work on it, providing the tools and materials needed for the job. About half of Edison’s 1093 inventions came out of the West Orange lab, showing just what you could do with smart people and the right resources. While the first floor offers the grand library and a storeroom that held a dizzying array of raw materials, the second and third floors give you a whole new perspective on the man and the business of inventing. Check out the sparse Room 12, Edison’s private thinking area and chemistry lab. Across the hall there’s a drafting room where workers drew plans of the machines that would mass produce inventions for market. Upstairs, the photography studio and darkroom show another part of Edison’s genius: he was one of the first to recognize the importance of images in marketing and advertising, even going as far as trademarking his signature and portrait. If you’re a music fan, you can’t miss the highlight of the third floor: the world’s first recording studio. Edison’s favorite invention (and the one that worked on the first try!) was the phonograph, and a chronological exhibit shows its development over time. You’ll probably be surprised by the lack of acoustical material in the studio, but the equipment was so basic at the time that it didn’t really make a difference. Park Rangers and volunteers demonstrate the technology twice a day, showing kids how their great-grandparents listened to music way before the advent of the iPod. We didn’t make the trip on the day I brought Ivan, but visitors can also get tickets to visit Edison’s home, Glenmont, just a mile or so away. The grand Queen Anne mansion is open only by guided tour, and if you time your visit well, your guide might actually be me! More on that to come. One last thing about the Fair Lawn jaunt: before we left town, Ivan told me there's something in the library that I had to see. I've come to trust his judgement on that kind of stuff, so off we went. Yup -- you got it. It's a 6 foot wide, 7 foot tall, 350-pound Rand McNally geophysical relief globe. And it rotates on its axis. According to a sign posted next to it when it was donated by the Rotary Club in 1967, it's the "largest, most accurate and detailed relief globe ever made. The prototype was created at a cost of 1/2 million [sic] dollars and took two years to complete." The sign also stated that on the globe, Mount Everest is 3/4 inch high, constructed of epoxy and reinforced with fiberglass laminations. It takes three minutes to make a full revolution. I did a little more research and discovered that this specific globe cost more than $12,000. The Fair Lawn globe had brothers at the Library Of Congress and the Buhl Science Center in Pittsburgh, though I couldn't find confirmation that those are still on display. In any case, globie here is not one-of-a-kind, but it's close. Rain came down in sheets this past Sunday, so the usual birding/exploration jaunt was curtailed quite a bit. As an alternate, Ivan suggested a trip to the Town for the Motor Age -- Radburn. New Jersey is home to a number of experiments in community planning, from the uber-exclusive Llewellen Park in West Orange, to the cooperative labor enclave of Roosevelt, and, of course, the concrete houses scattered around the state. Radburn, nestled within the Bergen County town of Fair Lawn, was conceived as a truly walkable living and working place that insulates pedestrians from motor traffic. Designed and built in 1929 by Henry Wright and Clarence Stein, Radburn adheres to Aristotle's dictum that cities should be built to give inhabitants security and happiness. Rather than looking at property from an individual use standpoint, the development was considered as a whole, taking the totality of residents' needs into consideration. The architecture has an attractive brick, quasi-Tudor look. Essentially, homes were placed along culs-de-sac, with the front of the structure directed to common park areas. "Service" areas of the home, like the kitchen, were set on the street side of the home so the living areas would have a nice park view. Sidewalks meander nicely through the area, emphasizing walkability. In a state where having a car is virtually a requirement, it was awfully visionary of Radburn's planners to create a haven where kids didn't even need to cross a street to get to their grade school. Instead, there's a charming underpass decorated by murals the kids painted themselves. Governed by a non-profit community association and designed for a population of 5000, Radburn currently has about 3100 residents living within a variety of homes. Most are single family homes, but townhouses, two-family houses, apartments and condos are available. Thus, a person could have a suitable place to live in the community throughout all stages of life: childhood, young single, married, parenthood and then retirement. In fact, you probably could live your whole life within Radburn's confines, considering what's there for your use. Food shopping is within walking distance, while the historic Radburn Plaza building offers services from salons to lawyers. There's also a considerable variety of recreation options: playgrounds, tennis courts, pools, an archery plaza, basketball courts, and a ball field. There is also a community center which houses administrative offices, library, gymnasium, clubroom and maintenance shops. If you want to get away, the Radburn train station is served by New Jersey Transit's Bergen Main Line. Unfortunately, the Great Depression spelled bankruptcy for the community's developers, and the full, expanded vision for Radburn was never realized. Nonetheless, it continues to make an impact on residential design as planners still visit to learn more about the concept and how it works. All in all, pretty darn cool. How much do I love Stuff Yer Face? I started going there as a Rutgers freshman, and I still return several times a year for one of their signature strombolis. They’ve made this basic Italian staple an art form, offering dozens of variations filled with any number of cheeses, meats and vegetables. Some have described it as a rolled-up pizza, but that doesn’t begin to explain how freakin’ good it is. Oh, and you know celebrity chef Mario Batali? He started his career there as a line cook, so I can honestly say I ate his creations before he got famous. Now, usually I make my SYF jaunts on a quiet afternoon, but this time we’d likely get there at its busiest. Would it be loaded with noisy college students, making us look like the quintessential mom and dad? More importantly, would we get a table before we both died of hunger? That last question was also complicated by a Turnpike warning sign prompting us to detour onto Route 130: that added an extra 15 or 20 minutes to the trip. Not surprisingly, there was a 30 minute wait for a table when we got there, so we headed to the bar so Ivan could check out their extensive menu of brews. It definitely lives up to its reputation. While there, we chatted briefly with a couple of very polite frat boys who were celebrating a birthday with pitchers of a neon-blue libation. At the other end of the bar, a couple more in our age range was whiling away their table wait by playing darts with their young daughter. We got called for a table right at the 30 minute mark, and I didn’t even have to look at a menu: Emily boli (vegetarian) and an enormous diet soda. And please bring it quickly. Not long later: yum. And a delicious way to conclude a long, eventful day of wandering, birding and exploring. It’s kind of neat, actually: when I started going to Stuff Yer Face back in the 80’s, it was rare to see anyone there over the age of 30. It seems that my contemporaries keep returning, even as the place continues to be wildly popular with Rutgers students today. Not all that far from the end of the Turnpike, but seemingly in another world, is Finn's Point National Cemetery -- a 4.6 acre burial place that contains the remains of over 3000 veterans. It's the third part of our refuge/fort/cemetery visit, and we found it by driving through Fort Mott State Park, first on paved road, then rutted dirt road, until we reached the simple iron gates that mark the entrance to this hallowed ground. Visible all around the stone wall surrounding it are tall phragmites that make brushing noises as they're stirred by breezes coming off Delaware Bay. While the cemetery still sees the occasional interment of cremains, most buried there were Civil War era deaths. Also buried there are a handful of World War Two German prisoners of war who were held at Fort Dix. The remote placement of the cemetery begins to make sense when you understand its proximity to Fort Delaware, an installation built just a few miles away, on Pea Patch Island, in the early 1800s to protect the mouth of the Delaware River. During the Civil War, the fort was used by the Union to confine Confederate prisoners captured during the battle of Gettysburg. By July of 1863, over 12,000 captives were being held on the 75 acre island, and disease and malnutrition took their tragic and savage toll. Sadly, the Civil War graves are not marked individually, leading one to believe that perhaps they were left in mass pits, a theory supported by the presence of a large depression in the ground. Instead, two large memorials mark the mass graves. The older, domed Union Monument was built in 1879 in memory of 135 Union guards who were stationed at Fort Delaware and died while on duty. The Confederate memorial makes a more stirring impression on the visitor. An 85-foot tall concrete and granite obelisk erected by the US government in 1910, its base holds bronze tablets that list all of the 2436 Confederate prisoners of war -- military and civilian -- who died at the fort during the war. You can't help but be moved by the simplicity of the site, and the magnitude of the suffering and loss it represents. A large plaque along the driveway holds the words of Lincoln's Gettysburg Address, a fitting tribute to those interred within the earth just beyond. It led me to wonder how we let each other suffer so, and why there seems to be no end to the constant battles mankind wages against itself. In an odd incident worthy of tabloid coverage, Finn's Point itself became a murder scene not so long ago. As part of a multi-state killing spree, a man named Andrew Cunanan fatally shot cemetery caretaker William Reese in 1997, stealing his truck. Cunanan eventually made his way to Florida, where he murdered fashion designer Gianni Versace. A few days later, he took his own life, closing a truly bizarre story. Stop two on the refuge/fort/cemetery tour was Fort Mott State Park in lovely Pennsville, NJ. Located on the shore of the Delaware River, Fort Mott was one of three Endicott-era installations built during the mid- and late 19th century to protect the mouth of the river, and the only one located in New Jersey. Just across, on Pea Patch Island, is Fort Delaware, and Fort du Pont is at Reedy Point, just east of Delaware City. During the summer, a ferry shuttles visitors between Mott and Pea Patch Island, but in the winter, you're pretty much on your own. Fort Mott once had more than 30 buildings, including offices, barracks, housing and a hospital, but many structures were taken down after the property was transferred to the State of New Jersey following World War II. Just about all that's left now are the gun batteries, a few buildings, a magazine and some observation towers. Given New Jersey's budget issues, the buildings were closed, but we could still roam around and read the wayside signs to learn more. To start, we found out a bit about the man who lent his name to the fort, Major General Gershom Mott, a native of Lamberton, near Trenton. Serving with distinction in the Civil War, he was wounded several times and eventually elevated to the rank of Major General. Following the war, he was offered a commission in the regular army, but chose instead to return to civilian life. Even then, he continued in public service as New Jersey state treasurer, major general and commander of the state's national guard. Turns out there's also a legend of questionable authenticity that his grandfather guided Washington's troops on the Delaware before the decisive Battle of Trenton. In any case, he's quite an impressive guy. The batteries lining the shore side of the fort are impressive in length: a 700 foot expanse that's a 35 feet thick mound of earth and concrete. They once housed disappearing guns -- three 10-inch and three 12-inch -- that could fire ammo weighing up to 1000 pounds to a distance of eight miles. Several smaller, rapid-fire guns were also installed in the batteries. Per custom, each of the batteries was named for a military veteran who had distinguished himself in service, and one has a distinctly New Jersey connection. Brigadier General Charles Harker was a local boy, born in nearby Swedesboro, and was killed in action in the Battle of Kennesaw Mountain, Georgia, in 1864. Ivan looked him up later and found that Harker had been orphaned at a young age and commissioned to West Point on the recommendation of his boyhood employer, who eventually became a member of Congress. Beyond the fort itself, the park is a relaxing place to have a picnic, play some ball or toss a frisbee on the expansive parade grounds. You can also enjoy a scenic view of Fort Delaware or the distant Salem Nuclear Power Station from the ferry dock. On the unusually warm February day when we visited, several families and couples were capitalizing on the sunny weather to get some fresh air into their lungs. Continuing on our Salem County jaunt, we headed to a three-in-one stop that contained a national military cemetery, an army fort turned state park, and a National Wildlife Refuge. For right now, I'll focus on that last one, the Supawna Meadows NWR. Encompassing just over 3000 acres of Delaware Bay marshland, Supawna's mix of fresh and saltwater habitat is an important stop for migrating and feeding waterfowl and shorebirds. Several types of raptors hang out there, too. Likewise, it's a good place to tromp around if you want to get your boots a little muddy, or if you'd like to get into the woods a little bit. We found parking near the grassland trail and set out on the walk. Given the warming temperatures and sunlight, it was really nice to be out, but it sounded as if the birds were elsewhere. In other words: it was totally silent, but for the pop-pop-pop of shotguns in the distance, reminding us that hunters were stalking deer in the distance. Sure, it was approaching midday, but come on, guys, throw us a bone and squawk or something! One trail took us through a moist wooded area with wayside signs pointing out various tree species, an especially nice touch when leaves haven't sprouted yet. Eventually, we got to an elevated observation area overlooking a field of phragmites, the nearest of which appeared to be trampled down. Still: no birdies. Not even a peep, or a honk or a quack. Another trail, in the other direction, brought us through grassland, along the edge of some more woodlands. There we heard some peeping, but alas, from frogs. Still, though, a wonderful harbinger of spring on a February day when temperatures were reaching the 50's. An elevated blind offered a view over a grassland distant; Ivan took a climb up and noted that the birds didn't appear to be there, either. We had a lot more trail ahead of us but concluded it would likely yield no more feathered fauna than we'd already seen. Thus we returned back to the car, making a note to return later in the year when more birds would likely be there. Supawna is also home to the Finn's Point Rear Range Light. Built in 1876, it looks much like an oil well or a black stovepipe supported by brackets, but it's actually designed as an aid to navigation and was once paired with a front range light on a standard lighthouse-type building, as well as another set of range lights farther south. While lighthouses help guide ships to shore and point out difficult areas, range lights help mark channels. Captains on ships coming up the Delaware River from Delaware Bay would sight both lights and determine they were on the right route when the two lights lined up. The Finn's Point Front Range Light was demolished after damaging floods in 1938, and the nearly 95-foot rear light continued operation intermittently until 1950, when the channel was dredged and enlarged. After a persistent campaign by local citizens, the rear light was added to the National Historic Register in 1978, and fully restored by 1984 with money dedicated by the U.S. Fish and Wildlife Service. In years past I've climbed the tower's 130 steps during New Jersey Lighthouse Society Lighthouse Challenge weekends (usually in October), and it's a humbling experience to tread those steps knowing the lighthouse keeper did it twice daily for years to light and then extinguish the beacon. Reports conflict on whether the tower is open for visitation; it wasn't while we were there, and as with any site run by a grassroots group, staffing can be spotty. If you're in the area, though, it's worth at least taking a look. And definitely let me know if you hear any birds while you're there.